Damn you, Mass Effect trilogy, why were you on sale on the PSN store? I’m doing nothing but playing Mass Effect 2 as soon as I get home and up to when I fall asleep with the controller in my hands. I finished the first game years ago and I quite liked it, but not enough to deal again with some of the wonky aspects that set my teeth on edge the first time around (i.e., driving the MAKO, dealing with the inventory system, the endless elevator rides, and so forth). So to refresh my memory on the plot, I read the fanfic Of Sheep and Battle Chicken. I would have been pleased if it were the official novelization of the game, instead of the rather bad spin-off novels that were actually published. It explores and expands upon stuff from the game, and where necessary it invents things wholesale. The story also isn’t shy about changing things drastically from the game’s plot to make the narrative flow better, which I quite liked. It’s by no means perfect, since small but persistent annoyances such as mixing up “its” and “it’s” and slipping between past and present tense happen quite a bit, but they weren’t enough to stop me. The fic’s writer really poured a lot of creative juice into this endeavour, as evidenced by the reams of text about this fictional world’s setting, akin to Tolkien’s volumes full of hobbit apocrypha. Anyway, that’s what’s been up with me lately. Also, guess what? 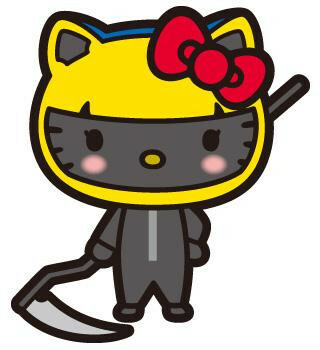 Hello Kitty is promoting Durarara. Ain’t that adorable?